For weeks now, I've been waiting for my amaryllis bulbs to bloom. 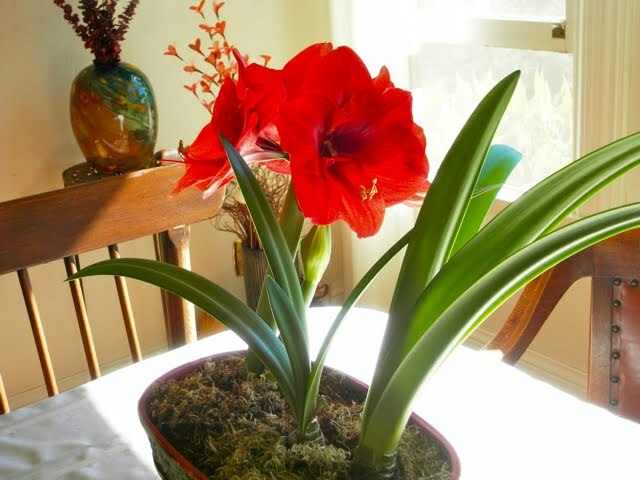 Actually, this is not an amaryllis plant, but a hippeastrum, flowering bulbs frequently sold in the winter months because of their ability to bloom indoors. I thought it was an amaryllis plant--even the flower company called it by that name-- but a quick trip to Wikipedia proved me wrong. So I am taking some poetic license here by calling it an amaryllis. This Christmas gift from relatives is now starting to share its showy, bold blooms, a welcome reward after the frantic days of shopping, cooking, and celebrating, a reminder of the best parts of the holiday season. As I was skimming the newspaper today a column on a book about a Chilean poet caught my interest, having been introduced to Pablo Neruda on Naida's blog, the bookworm. 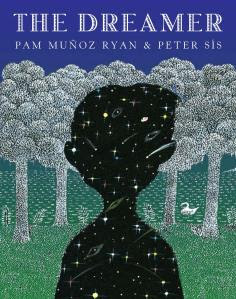 Author Pam Muñoz Ryan received the 2011 Pura Belpré Award from the American Library Association for her book, The Dreamer, published in 2010, illustrated by Peter Sis, which is a fictionalized account of the poet's early life (childhood and adolescence). The author became intrigued by Neruda's life and spent about four years working on this novel, which has also won several other awards. I found a wonderful review of The Dreamer on Bookshelf: What We're Reading. Got crumbs? Please stop by my other blog, La Vache Intéressante, to enter a fun giveaway I'm currently hosting for a little cow tabletop vacuum. I also have an assortment of giveaways listed on the right side of this blog, so take a look when you have a moment. Really Random Tuesday is a way to post odds and ends--announcements, musings, quotes, photos--any blogging and book-related things you can think of. If you're inspired by this idea, feel free to copy the button and use it on your own blog. Leave a link in the comments if you’re participating and I'll add it to this post. For another Really Random Tuesday post, please visit Vivienne's blog, Serendipity. The flowers are beautiful Suko! A promise of Spring to come. We actually had an ice storm here starting last night. Seeing flowers in bloom would be a nice change. The Dreamer sounds great, what a nice idea for a book. I'll have to keep a eye out for it. Your flower is gorgeous! I tried doing that one year and was a total failure. this reminds me, i need to plant my paperwhite bulbs!! Kathy, this one was easy to grow; it seemed to thrive on neglect (and little water). Carrie, I also enjoyed Esperanza Rising, very much. Thanks for your visit. The Amaryllis is beautiful. So bright and cheery. Thanks for visiting My Reading Corner today. I hope there will be more blooms soon. Thanks for all the nice comments! Those are some fabulous flowers! I wish I had the sort of climate to here to grow whatever I wanted! Your flowering plant is really beautiful! I love the color, and imagine that it's really a nice thing to look at during this blustery winter. I do not have a green thumb at all, and often I forget to water my plants, which is why I never have anything pretty like that for my table! Your flowering plant looks lovely. Thanks for the comment. I will try and keep up this year. Beautiful flower! I got begonia to bloom all winter last year in the garden window. I'm going to have to try amaryllis next year, it's much lovelier.